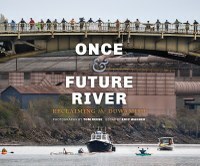 In Once and Future River: Reclaiming the Duwamish, photographer Tom Reese and writer Eric Wagner grapple with what restoration means: When a river has been altered beyond recognition, to what state should we restore it? What do we owe to a landscape we’ve damaged so deeply? And should we even try to rescue something that’s become too fragile to survive without us? The manmade and the natural intermingle in these pages as they do along Seattle’s Duwamish River, a body of water straightened, dredged and polluted. A pile of concrete echoes a mountain; a collection of objects culled from the water by cleanup volunteers mirrors an osprey nest built of “locally sourced materials.” From the recovering chinook salmon to the manufacturing plants that turned the Duwamish into a Superfund site, the images in this book portray a dynamic river carrying its complex legacy into a difficult recovery.